Yasmin Warsame is probably one of the most recognizable Canadian Supermodels in the industry. The Somali-born Canadian has been modelling professionally for the better part of 15 years and has every right to be a complete Diva, but she soooo isn’t! Now I am not one to become unglued when meeting high-profile people, I breezed through my interview with Jeanne Becker when I covered my first season at Toronto Fashion Week and I am always stalking Glen Baxter for his reaction to the shows; but for some reason when I met Yasmin backstage I seriously was speechless…(maybe one day I will tell you guys what happened when I came face to face with my idol Jay-z). Your girl said nada, zip, zero, zilch! I didn’t even have the presence of mind to do my job and ask her for a photo or a quick interview. Hangs head in shame…alas tis my trial, I freeze at times. Well just a few short months ago I saw the photos from an editorial that she did for Flare Magazine’s January 2012 issue. The pictures are breath-taking and the styling and direction were exceptional. I want the Marchesa dress and I would slap my momma for them Nicholas Kirkwood shoes. Check out the pictures for yourself and see what all the fuss is about. Yasmin Warsme for Flare January 2012 Photos by Andrew Soule Art Direction Tanya Watt. Fashion Director and Styling Liz Cabral. It’s a totally excititng time right now, its also frustrating, challenging, mind numbing and exasperating…ah such is the life of a director. So this is the part where your wondering what’s so exasperating, challenging, blah, blah, blah. It’s this; I’m co-directing a photoshoot with my lovely co-director Renee Thompson. So what does that mean? That means that we have come up with a photo story and pitched it to a magazine, they loved it and now we are in execution mode, meaning pulling together the team to bring the creative story to life. Oh yeah the magazine is Sway. You know, the premiere black magazine in Canada. It’s been awesome but also crazy at the same time. As a director there are tons of elements that you have to consider before going forward. 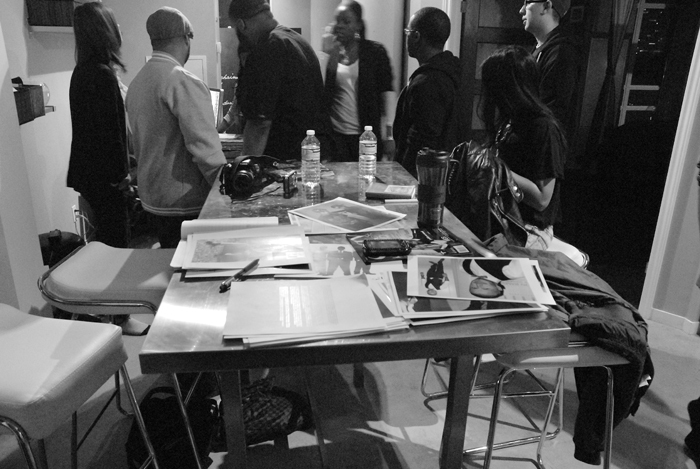 You have to think budgets and subject matter, and photographer and wardrobe stylists and make up artists. You have to make sure that it will all work together. I honestly don’t know how people who don’t have previous project management experience pull this off all of the time; because even with my experience it is still nerve wracking. Right now we are past the point of casting and pulling together the team. We have a great group of people working with us and we are super excited to do the shoot which is coming up soon. So who’s it gonna be, our photographer is Kwaku A Kufuor, fashion stylist Michelle Lyte and make up artist Roxanne DeNobrega. The photos will appear in the people with Sway section of the magazine and will feature A-Game, Regular Robb, Lissa Monet, and DBS studios. In prepartion for the shoot we needed to get everyone together to have their measurements taken and to discuss looks as well as inspiration for lighting and shot composition. Overall it was a great day, check out the pics from that day and stay tuned to see the pics from behind the scenes at the shoot! Photos are by our amazing photographer Kwaku Kufuor.